Cimcool Fluid Technology, Cincinnati, OH, introduces Cimperial 1072-HFP, a single fluid recommended for all metal alloys and heavy-duty machining operations, including turning, drilling, tapping, reaming, gear cutting and broaching of high-speed steels, cast steels, alloy steels and tool steels. 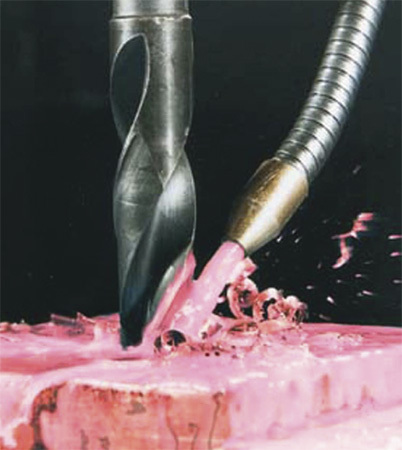 The product was developed for use in high-fluid-pressure applications, including through-the-tool. imperial 1072-HFP provides excellent lubricity; extends fluid life with excellent biological control; is operator-and machine-friendly and helps prevent in-process corrosion on parts and machine components. The fluid is packaged in 5-gal. pails, 55-gal. drums and in bulk containers for mixing with water at a recommended starting dilution of 5 percent and a typical operating range of 5 to 10 percent.